“Do you know how to hunt?” asked the wolf. “What are you going to do?” asked the wolf. “Yes you do,” the wolf told her. “Take a deep breath. When a young Indigenous girl loses her mother in a forest, she feels panicked and scared. A friendly talking wolf comes along and reminds her that there are things she can do to help herself. Rather than telling her what to do or simply leading the way to her mother, the wolf allows her to discover her inner strength and wisdom. The girl’s sense of worry diminishes as she eats berries to nourish her hunger, drinks water from the nearby stream to quench her thirst, and spots familiar trees around her. In the end, she reunites with her mother and shares her story of being helped by a kind wolf. Throughout The Girl and the Wolf, there are various symbols and teachings of the Indigenous culture. For starters, the characters are Indigenous. Secondly, the wolf represents one of the Seven Sacred Teachings: Humility. A part of humbleness is putting others before yourself, which is exactly what the wolf did by spending time helping the lost young girl. In Western culture, many children are exposed to stories with “big, bad wolves”. Contrary to that perception, the wolf in this story is kind and helpful. Another cultural piece demonstrated in this book is the tradition of gifting tobacco as a way of expressing gratitude. Before the young girl goes to sleep, she ties tobacco (one of the four sacred medicines) in a red cloth and leaves it by a bush in hopes that the wolf will receive it. Also, the young girl wears a red dress which may represent the REDress project honouring missing and murdered Indigenous women in Canada. This picture book contains poetic elements, such as repetition and stanzas. Also, the story evokes emotion in a similar way as poetry does. The earth-toned colour palette of the illustrations match the mysterious tone of the story as the young girl searches for her mother. The unique artwork reflects a feeling of hominess. The ground looks as though it is a patterned sewing fabric. There is much that can be taught through this young children’s picture book. Many subtle teachings exist within this beautifully written and illustrated story. 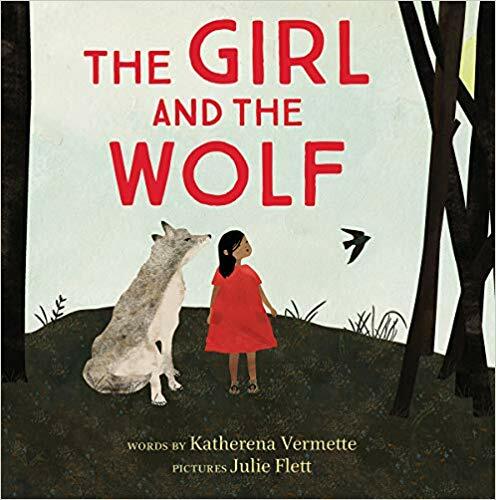 The Girl and the Wolf would make for an excellent read-aloud in a classroom, library, or home setting. Katherena Vermette is a Métis author in Winnipeg, Manitoba. Several of her previous books have won multiple awards, including the Governor General’s Literary Award for Poetry. More details can be found in the Author’s Note included at the back of the story. Julie Flett is a Canadian award-winning artist who studied fine arts at multiple Canadian universities. She is Cree-Métis and currently resides in Vancouver, British Columbia. Andrea Boyd is an early years’ teacher in Winnipeg, Manitoba, and a graduate student at the University of Manitoba.